For Bank PO, SBI PO, RBI, MBA, Railway and many more. 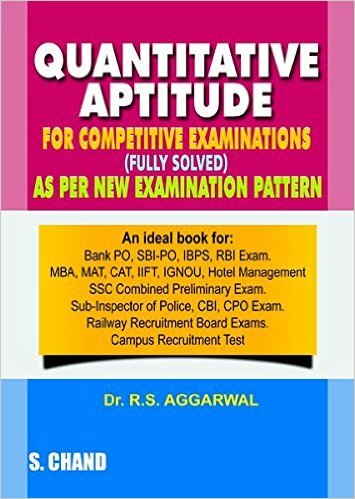 The Quantitative Aptitude For Competitive Examinations by R.S. Aggarwal is a handbook of mathematical questions covering the extensive syllabi taken into consideration by most public competitive examinations held in the country every year. The book covers a complete range of questions, with thoroughly worked out solutions in detail. 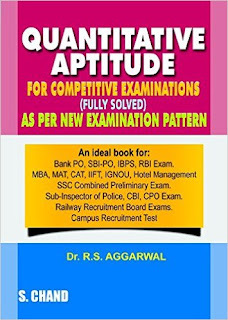 Coming from S. Chand publications, this is the seventh edition of the book and is referred by many as the “holy grail” to successfully crack the quantitative portion of the competitive examinations. Born in Delhi in 1946, R.S. Aggarwal completed has studied at Kirori Mal College in Delhi. He had been a lecturer in Nanak Chand Anglo Sanskrit College in Meerut, Uttar Pradesh till he managed to secure a fellowship to pursue his doctorate in Delhi University. Later on, he became a Reader in NAS, Meerut before moving to MMH, Ghaziabad. He has authored about 75 books on Mathematics for school students as well as for those appearing for competitive examinations.